Note: This post will only (possibly) be of interest to buyers of the 2016 RAV4; if you’re not one of what I assume is a handful of people (at most), move along—there’s really nothing to see here! Posting mainly so I remember what I did. We recently bought a 2016 RAV4, and (so far) love it. However, there’s one thing that bothered us: the front of the rear cargo area is visible to anyone who glances in. 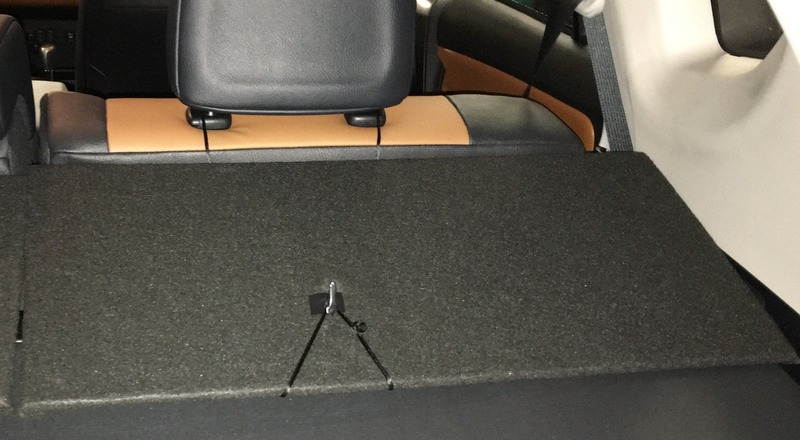 Toyota sells a cover for the cargo area, but unlike those for past RAV4s, it doesn’t attach to the rear setbacks, leaving the front area uncovered. This means that a good sized chunk of the cargo area is still visible, even with the cargo cover in place. I had a lot of different thoughts, but wound up using foam core covered by felt, attached with some flat black nylon string. Note: These covers require the cargo cover, as they use its crossbar for support. They may not be the loveliest things in the world, but they work perfectly and meet every one of my original objectives. Stapler for securing some of the felt to the foam board. If you had to buy absolutely all of this, you’d be out $32 or so; I had most of this stuff in the garage, except for the foam core, fabric, and string. Remember, measure three times, cut once. And use something you an run the X-ACTO knife along to help keep the cuts straight—I used a long level. Cut the foam core board in half lengthwise, so you have two 28″x10″ pieces. Create two pieces of final-cut foam board: One 30.75″x10″, the other 21.50″x10″. Note: Please measure your own vehicle’s space before cutting. These are the values that worked for our car, measuring from the outside edge of the plastic trim in to the spot where the seatbacks are split. You want the two pieces close, but not jammed against each other, so they can move independently when the seats recline. If your foam board is less than 30.75″ wide, you’ll need to make one piece longer. I did that using duct tape—as seen in the image at right—with a piece cut from the “short” piece of board. This seemed to hold just fine (especially as it is also wrapped in felt). For good measure, I ran a line of glue along the seam, too. Cut felt to fit each piece, and glue to one side. After glue dries, turn over and wrap/glue felt to the bottom side. I wrapped the ends of the felt onto the bottom of each board (trimming excess first), and secured it in place with staples—the 3/16″ thickness of the foam core allows the staples to go in, but not stick out the other side. Repeat the tape-mark-spot process with the center headrest. Put the short board in the car on the right hand side and again mark the midpoint of the headrest with a piece of tape. Back at the workbench, measure down from the front (top—the bit closest to the rear seats) on each board roughly 7.5″ inches. Measure at the horizontal location you marked with tape. This is where I positioned the “hook” portion of each Command Hook. Mark this spot, and repeat for the two other hook locations. Note: There’s nothing magical about 7.5″—I just wanted a spot that was past the midway point, so I split the difference with the full width. Use the X-ACTO knife to slice a small opening in the felt, just large enough to slide in the Command Hook’s base. Repeat for all three hooks. Apply glue to the bottom of a hook, and slide into place with the base under the cut felt. Check the measurement to make sure the hook portion is at the 7.5″ mark. Use a bit more glue on top to secure the felt to the top of the command hook’s base. Repeat for each hook. After everything dried, I wrapped the hooks with black tape, to get rid of the shiny silver. It’d be more professional to paint or PlastiKote or something, but I was in a hurry and I’m cheap. Take the finished boards back to the car, along with the black string. Wrap the string around a headrest, then down the seatback and up under the board, then around the back of the board and up to the hook. Find a length you like that creates whatever angle you like on the board, and tie off the string to that length. (It’s important that the string be relatively taut.) Repeat for each of the other two hooks. And that’s all there is to it—it’s much easier to do than to write up, actually. Here’s a close-up of each side cover (click to zoom). Because there’s nothing but felt and nylon string in contact with anything, there’s no noise from these covers. They move relatively well as the seats are tipped back/forward, and because everything’s black, there are no reflections on the window. They’re also incredibly light (so clearly not load bearing! ), and easy to store in the car if not in use. 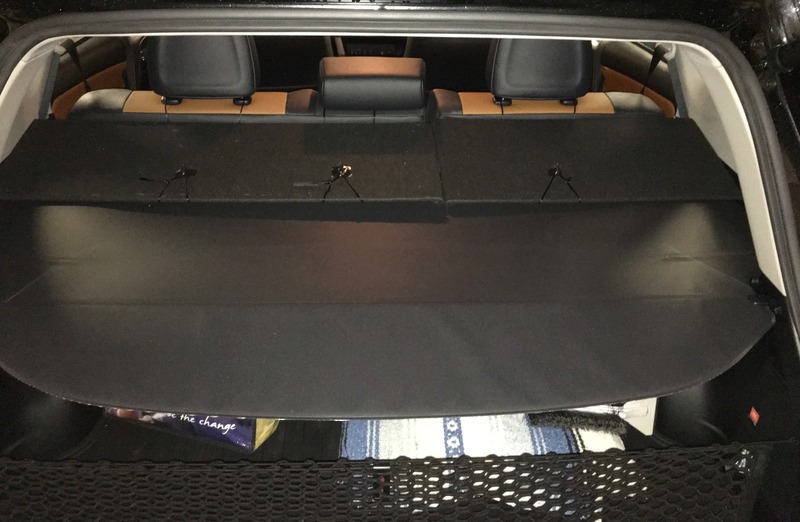 I hope Toyota eventually releases a front-area-covering cargo cover, but until they do, we’re quite happy with our (actually way less than) $32 homebuilt solution.